MIAMI, Florida (CNN) -- Hurricane Bertha -- the first hurricane of the 2008 Atlantic season -- increased in strength Monday evening, according to the National Hurricane Center. While Bertha's power may fluctuate over the next day, it is expected to begin gradually weakening by Wednesday, the center's 11 p.m. ET advisory said. Bertha's became a major -- or Category 3 -- hurricane Monday afternoon. A Category 3 has wind speeds of 111 to 130 mph. As of 11 p.m. 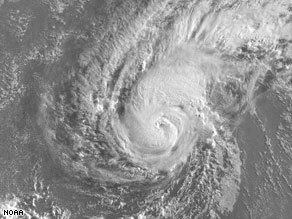 ET, Bertha was 695 miles (1,115 km) east-northeast of the northern Leeward Islands and about 1,085 miles (1,745 km) southeast of Bermuda. The eye was moving toward the west-northwest at about 12 mph. Its maximum sustained winds were clocked at 120 mph (195 km/hr), up from the 115 mph mentioned in a 5 p.m. advisory. iReport.com: Are you ready for hurricane season? The hurricane is expected to turn to the northwest and decrease its forward speed in the next 24 to 48 hours, the center said. "It is still way too soon to determine whether or not Bertha will affect Bermuda," the center said. The first tropical storm of the season, Arthur, formed May 31 near the coast of Belize and dumped heavy rain on Central America and southern Mexico.